Rendering by Dattner Architects via NY Landmarks Preservation Commission. 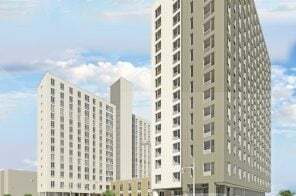 An affordable housing developer on Tuesday presented plans to the Landmarks Preservation Commission for a new building that would cantilever over the Empire State Dairy building in East New York. 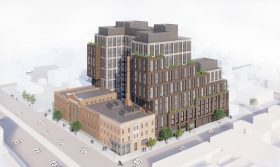 HP Brooklyn Dairy Housing Development Fund Company, part of the nonprofit Housing Partnership Development Corporation, wants to construct a 14-story tower on top of the early 20th-century factory, located at 2840 Atlantic Avenue. Landmarked in 2017, the factory is notable for its architectural style and decorative tile murals. Dattner Architects created the designs for the proposed complex shown in the new renderings. The new construction would be a major change for the property, which was purchased by the developer for $16.75 million last year. The Landmarks Preservation Commission (LPC) on Tuesday gave mixed reviews for a proposed new concession pavilion outside of the landmarked fireboat station at the Fulton Ferry Landing. 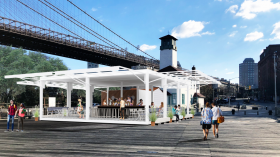 The proposal, chosen last December by the Brooklyn Bridge Park (BBP), includes constructing an outdoor restaurant and bar that would connect to an adjacent utility shed and sit in front of the two-story fireboat station, previously home to the Brooklyn Ice Cream Factory. 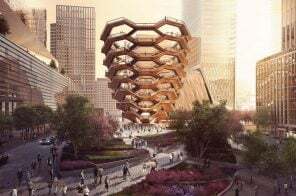 While Alex and Miles Pincus, the operators of the proposed space, designed the outdoor concession to be simple and airy, some LPC commissioners expressed concern over the structure possibly blocking views of Manhattan and the need to keep the space as open as possible. 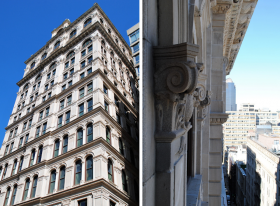 Update 4/1/19: The New York State Court of Appeals on Thursday ruled against a group of preservationists who sued to stop developers from turning a historic clock tower into a penthouse. According to the judge, the LPC does not have the authority to give access to the building and the agency’s plan to make the 19th-century clock run electronically is reasonable. 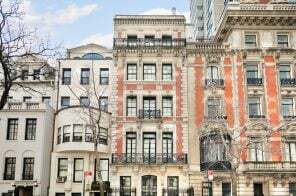 Developers had big plans for the luxury condominiums they were creating at the block-long former site of the New York Life Insurance Company at 346 Broadway (also known as 108 Leonard Street) since purchasing it from the city in 2014. 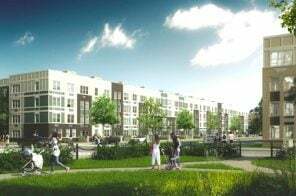 The new residential project would hold 140 units starting at $1.5 million, capped by a stunning penthouse that would be priced at over $20 million. The one snag in this golden opportunity: The building’s iconic Clock Tower–sometimes called New York’s ‘Big Ben,’ which sits atop the building and was designated an interior landmark in 1987. The clock must be wound by hand, a process which requires access through, as the New York Times reports, the future penthouse. A case against the developers’ plan and a subsequent appeal were both won by the opponents, saying the LPC couldn’t unwind the clock’s landmark status–but an appeal in the state’s highest court, the Court of Appeals, is still pending. Image courtesy of Landmarks Preservation Commission. The Landmarks Preservation Commission voted today to calendar the Bay Ridge Parkway Doctors’ Row Historic District in the first formal step toward designation. The proposed district is comprised of 54 architecturally consistent row houses along Bay Ridge Parkway between 4th and 5th Avenues in Brooklyn’s Bay Ridge neighborhood. The row of limestone-fronted houses–referred to as Doctors’ Row based on both its historic and current residential demographics–is a distinguished example of the neighborhood’s growth from a suburban resort community to an urban neighborhood ahead of the 4th Avenue Subway line in the early 20th century. 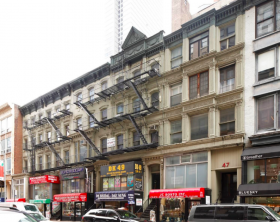 The Landmarks Preservation Commission voted on Tuesday in favor of calendaring five buildings on West 28th Street in Manhattan’s “Tin Pan Alley,” in the neighborhood now called Nomad. The buildings at 47-55 West 28th Street were an integral part of the area known for having New York City’s most significant concentration of sheet music publishers at the turn of the 20th century, and as the birthplace of iconic American songs like “God Bless America.” It’s also where popular music icons like Irving Berlin and George Gershwin wrote songs. Calendaring is the first formal step in the historic status designation process. 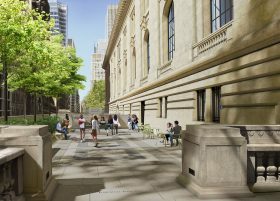 The city’s Landmarks Preservation Commission on Tuesday approved the New York Public Library’s plan to add a new public entrance and plaza to its Stephen A. Schwarzman Building in Midtown. The changes fall under the library’s larger master renovation plan, a $317 million project first unveiled in 2017. 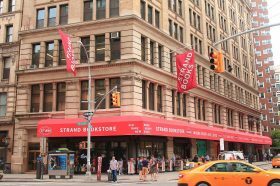 The LPC approved the changes to the exterior of the building–subject to the city’s landmark rules–after design modifications suggested at a presentation in February were made by the library, Curbed NY reported. 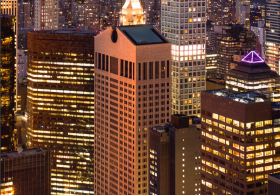 In December, 6sqft reported that architecture firm Snøhetta had unveiled a preservationist-friendly revision to a controversial design for an updated AT&T building at 550 Madison Avenue; last month brought more details from the firm’s proposal that was submitted to the Landmarks Preservation Commission (LPC). The most recent design is one of several revisions, each followed by controversy over being seen by preservationists as diverting too much from the building’s original design by Philip Johnson and John Burgee. Yesterday LPC approved the new preservation-friendly designs–with some modifications. The office tower is now on track to reopen in 2020. 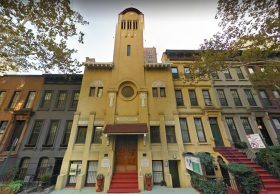 The New York City Landmarks Preservation Commission (LPC) has voted in favor of giving a calendar spot in the landmark designation process to the First Hungarian Reformed Church of New York, one of few religious properties designed by the noted New York City architect Emery Roth–himself a Hungarian immigrant. The church is also significant for its importance to the Hungarian-American community that settled in the Upper East Side‘s Yorkville neighborhood. 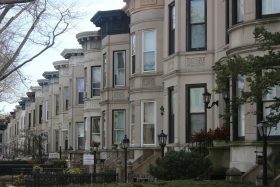 The New York City Landmarks Preservation Commission (LPC) voted today to calendar the designation of four historic districts in Sunset Park, Brooklyn consisting of Sunset Park North, Central Sunset Park, Sunset Park 50th Street, and Sunset Park South, representing the Brooklyn neighborhood’s most cohesive and intact concentrations of high-quality architecture. 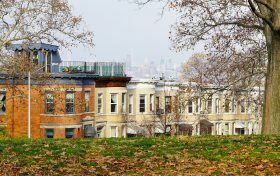 The neighborhood’s preservation organization, Sunset Park Landmarks Committee, requested consideration for historic district status in 2014.